A Rising Sign or Ascendant Sign is said to be the mask a person wears in a public setting. The personality of one’s Rising Sign is how the people around them perceive that individual. Try the rising sign calculator to know what your ascendant sign is! 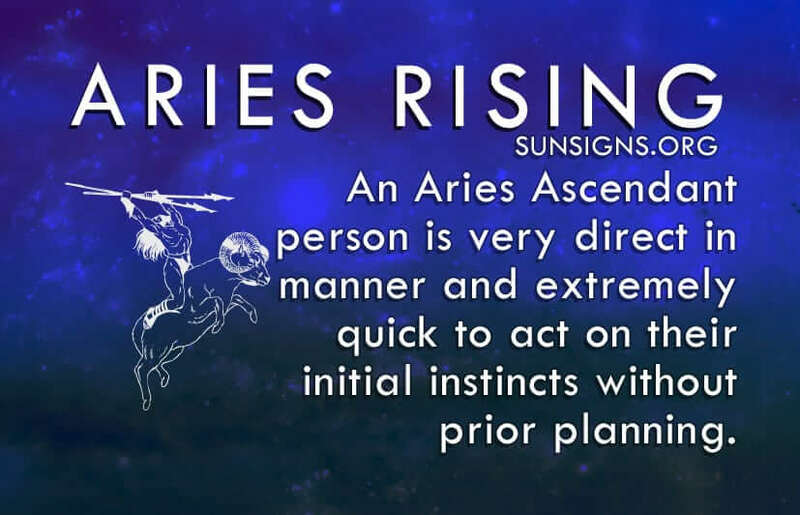 An Aries Rising person is very direct in manner and extremely quick to act on their initial instincts. They do so without prior planning or first considering the consequences and outcomes. If an Aries decides they want something, they will not hesitate to go and get it. Though their actions are often sudden and rash, their intentions are seldom anything but good. The ascendant in Aries individuals are highly prone to bursts of anger. However, they are just as quick to let the situation pass as they are to become so upset in the first place. Aries rising sign are not ones to hold grudges. Though they will often be very open about what is angering them, their straightforward statements are not meant to be offensive or rude. A person with Aries ascendant have the possibility of being rather competitive, especially in athletics, which they excel in. However, the most important thing to an Aries zodiac sign is improving and bettering themselves rather than beating out others. They put the most pressure on their own shoulders, taking the responsibility to obtain what they want solely on their own. This tendency can easily become a problem, as an Aries will very rarely stick with a project or goal long enough to complete it. The world surrounding a person of the Aries rising sign is quick to change. This is bound to happen as Mars is your ruling planet. And they will often turn to a new project before they spend too long working on a previous one. Aries Rising feeds on action, and their strengths lie in their abilities to create new activity. (Get your free career horoscope). From a very young age, a person with their ascendant in Aries will demonstrate their strong sense of independence that they will carry with them all through their lives. They constantly appear to have everything under control, even if they do not. So people will rarely make a strong effort to help them. Despite this incredibly self-reliant tendency, they become highly attached to they people they hold dear. Physically, an Aries rising sign person has a high distinctive, swift walk, their head ever so slightly leaned forward. They are prone to slight acne problems, headaches, sinus infections and eye problems. Typically, they will have broad shoulders and slim hips. There is a certain charm to their youthful attitude and they are quick to flash a smile. Aries Rising in astrology are extremely passionate and if they are interested in someone, they will chase whomever it is they admire. Though this can be slightly overwhelming to some people, an Aries ascendant sign has a way of making themselves incredibly difficult to resist. They are romantic, charming, enthusiastic, and will definitely be the one to take their lover on a lovely, but adventurous date. Their perfect match, whether in a friend or life partner, is someone who can keep them grounded. Those with their ascendant in Aries are dedicated people with very success oriented personalities. Their ambition has the possibility to come off as selfish sometimes. This is because they are usually so focused on their goals that they disregard others that may be involved or affected. In the end, however, their need to accomplish any and all feats, no matter how big small, ridiculous, or unpractical they are, is what allows them to achieve. Overall, an Aries Rising is a great person to have around on a night out. They provide everyone around them with adventure and a good time. Though they can be highly independent, their greatest weakness comes from overworking themselves and biting off more than they can chew. At the end of the day, an Aries Rising is a wonderful person to have around.